That Chemistry Show, presented by the University of Victoria Chemistry Students’ Society, helps raise money for the United Way and other charities. 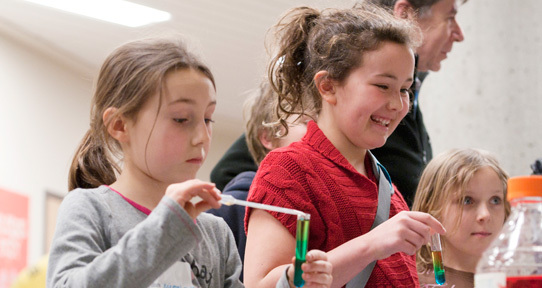 Students, faculty and staff are active supporters of outreach programs such as the Scientist in the Schools program (events coming up), the STEM program, and the annual Science Fair. We're engaged with the United Way, the CIBC Run for the Cure, the YWCA Women of Distinction program, and many other community groups. And we're active in many professional organizations: Association of the Chemical Profession of British Columbia, the Canadian Society for Chemistry, the Vancouver Island section of the Chemical Institute of Canada, the American Chemical Society, the Royal Society of Chemistry, and more. Professors from the department appear in all forms of media when an expert opinion is sought on a newsworthy topic (including the department's own research). Visit our alumni pages for more details on how we can engage with you. 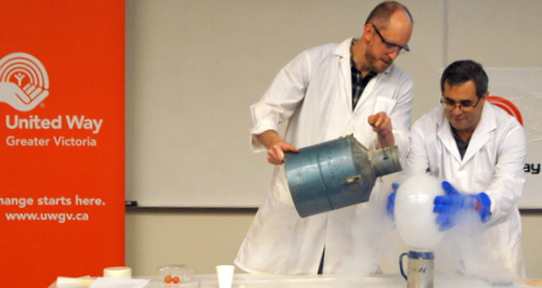 The regional finals of the Vancouver Island Regional Science Fair are held annually at UVic and have had strong support from chemists working either in the university or around Victoria.